I loved my holiday ham (Kurobuta, my favorite!) and whittled it down to just scraps of meat surrounding the bone – so it’s time for soup! Don’t have a leftover ham bone? Just ask us for ham shanks, thanks to the cut the flavor is even better than the bone from a leftovers. 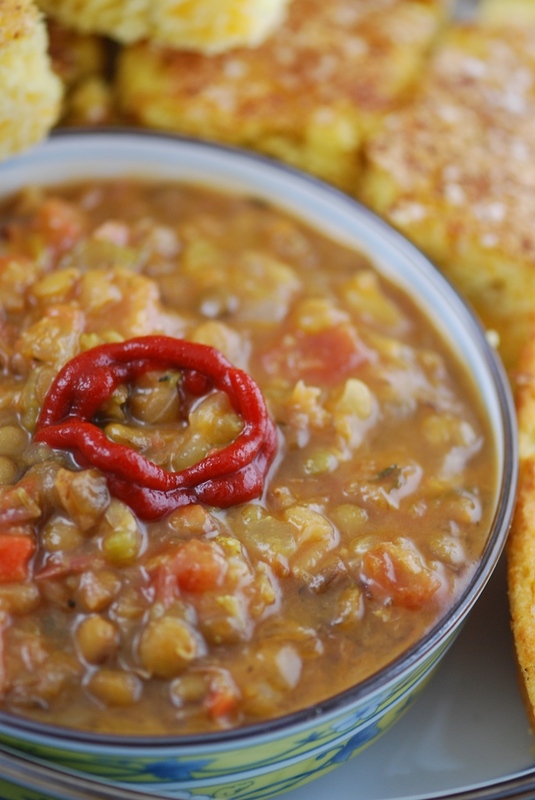 Healthy eating is the mantra of the New Year, and memories of Mom’s Italian lentils and spaghetti soup have been tempting me lately – so my beloved ham bone was the base of this delicious lentil and vegetable soup. I served this big batch of soup several ways to keep things interesting. At first I paired with cheddar cornbread (notes below) and a few dashes of Sriracha hot sauce for kick (pictured left). The next day I treated it like ‘red beans and rice’ and kicked it up in the bowl with Mexican hot sauce and a shot of ketchup and it tasted like a completely different soup. Perfect with a cold beer! Then the following day we made it Italian, serving the soup over spaghetti noodles with plenty of grated Parmigiano Reggiano cheese and hot Manoucher Basil bread (an amazingly moist bread in our freezer case.) It was particularly nice this way with wine! So keep in mind that recipes are like a general guideline that should be fine tuned to your taste. Buon Appetito – Salute! Sea salt and fresh cracked black pepperRemove meat from bone, chop and reserve (1 cup is nice, 2 plus cups is better! If you like a lot of ham, ask the deli clerk for an end piece of ham at a discount). Place ham bone in water along with bay leaves and crushed red pepper and bring to a simmer – cover partially and cook until the bone is almost ready to fall apart – 1.5-2 hours – skimming as needed.Add lentils, garlic, tomatoes and hard veggies (reserve softer veggies such as broccoli and cauliflower, adding last 15-30 minutes of cooking time). If a lot of the water has evaporated, add more as desired. Simmer partially covered for about 1 hour, chopping tomatoes with a spoon and stirring occasionally. Add reserved chopped ham. Taste and adjust with chicken, vegetable or ham base (if a richer flavor is desired) and salt and pepper to taste. Serve. 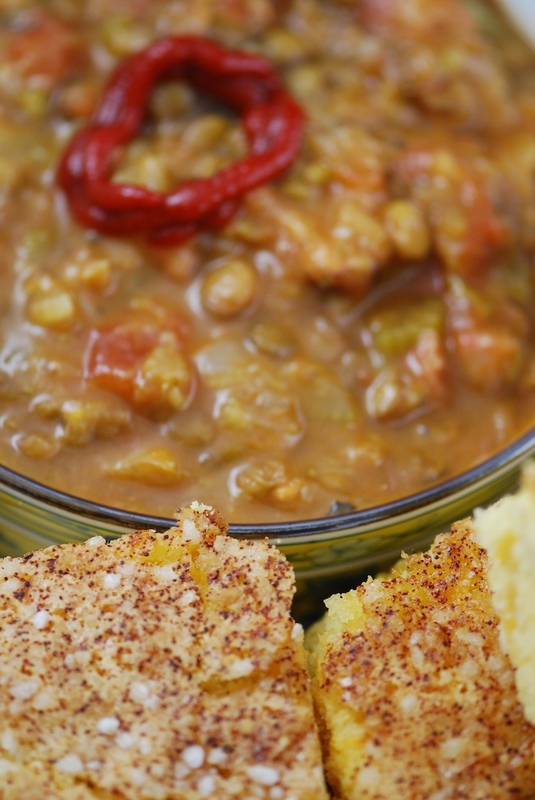 I’ve got a thing for moist cornbread with cheddar, chiles and a sweet top crust. Not hard to do from scratch, (find a recipe here for Spicy Cheddar Cornbread), and a real snap with a mix. For a fast and easy batch, I strongly suggest the Marie Calendar’s brand mix (offered at our markets) blended with 4-6 oz chopped green chiles and 4-6 oz of sharp grated cheddar. Just before baking, I finish the top with a hearty sprinkle of Maple Sugar (or coarse ‘Sugar in the Raw’) and a sprinkle of dry ancho chile. This forms a great crust for the first day, but will soften when leftover. If you have some pearl sugar, sprinkle that on too – it makes the top extra crispy. That cornbread looks amazing. You know I'll be giving that a try. My ham bone was put to work studiously flavoring some beans after Christmas, but I do have a couple of ham hocks in the freezer that were just waiting for this recipe. I love that ring of Sriracha. Thanks for the Red Chili Sauce recipe!